To call Bernd Ogrodnik’s puppets “lifelike” understates the case. They’re actually alive, you intuitively feel when you’re up close and personal with them in a front row seat at Surrey City Hall’s spiffy new Centre Stage theatre. To be sure, half the characters onstage are indisputably flesh and blood – Ogrodnik’s own hands and feet, perhaps embellished with doorknob heads or googly eyes or burlap cowls, inter alia. But even the marionettes and stick puppets he’s hand-carved out of white fir have independent lives and agency, as far as Ogrodnik’s concerned. On the Surrey stage, she calls into being a slow-spinning pinwheel of a planetary orb, which then sprouts plants, animals, an Adam, an Eve and a Tree of Life that flourishes, fruits and finally shrivels down to a desiccated trunk as the globe reabsorbs its creatures and its patron goddess mourns. Other Metamorphosis vignettes are similarly serious. There’s a whole life-cycle, compressed down to a few minutes, of a mother-daughter pair. From the birth of the child to the burial of the parent, they’re represented solely by a series of hand-manipulated masks and veils. 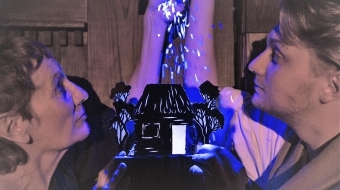 Especially striking, to my mind, was the silent interaction between Ogrodnik and one of his most sophisticated creations – an intricately articulated yard-long marionette left over from his 2004 tour de force as technical designer and lead puppeteer of the 2004 cult classic feature film Strings. Stripped of his costume, the manikin raises his immobile, affectless face in existential wonderment as he reaches for the proffered cruciform marionette control rack. It’s like a barebones abstraction of Michelangelo’s Creation of Adam. Not that all of Metamorphosis’ adult puppetry is so weighty and earnest, though. Some of it is just witty caricature, like a scene of a fist-faced frog-eyed witch who keeps mixing and swigging potions that make her sprout first a hooknose, then a beard, then hands, then feet. Or there’s a tenderly raunchy courtship between Ogrodnik’s right and left hands; it ends in marriage and then a wedding night in which Righty seductively ungloves Lefty. Some scenes captivate us with sheer technical wizardry. Ogrodnik can turn his bare hand, with just a knob head and feet, into a graceful slo-mo pole-vaulter. 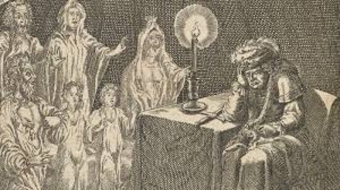 Or he can make a hankie ghost dance out of its deathbed to the strains of the puppeteer’s live performance on a transverse flute, which is simultaneously strung up to serve as the marionette’s control armature. That stunt shows off Ogrodnik’s polymath background. He trained as a classical musician in his native Germany and then learned martial arts on his worldwide travels, skills which imbued him with the sense of balance, dexterity and timing so crucial to the chosen career of puppetry to which he committed himself some 40 years ago. At about the same time – and after a decade of residence in the U.S. and Canada – he embarked on a lifelong “love affair” with the “magical island” of Iceland. He and his wife, Hildur Jónsdóttir, set up a puppetry arts centre in a spectacular fjord some 45 minutes outside Reykjavik, the national capital. When funding dried up in the wake of the 2008 global recession, he took up his present position as puppetry director of the National Theatre – in effect Iceland’s Puppeteer Laureate, with a dedicated 90-seat playhouse of his own in the theatre’s attic. That scale might be more appropriate to Ogrodnik’s style of table-top puppetry than even the relative intimacy of Surrey’s 200-seat, acoustically perfect Centre Stage. But he’s versatile enough to adapt to any performance space and format. One advantage of Iceland, he points out, is that it’s handily situated right between North America and Europe, where he’s a lionized celebrity in puppetry circles. 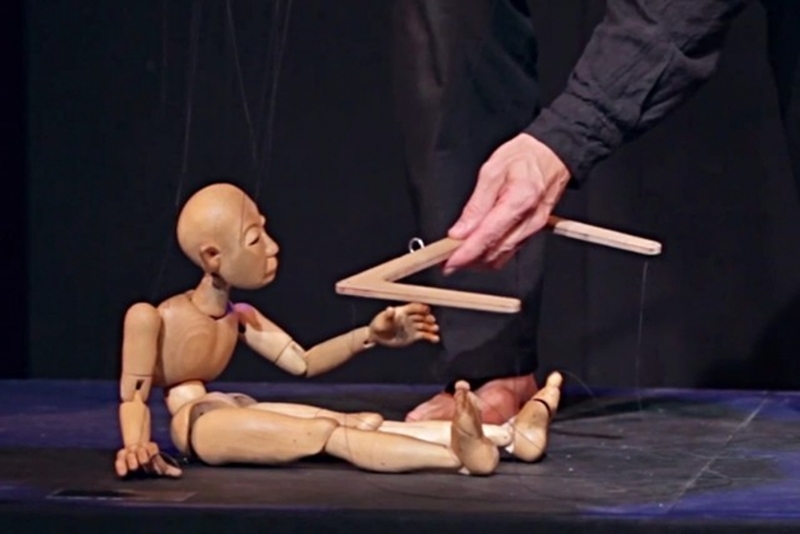 He and Jónsdóttir also continue to teach and learn in such Asian puppetry meccas as Taiwan, India and – especially – Indonesia.